“Tabu” is an interesting two-part film from Portugal and Brazil from Miguel Gomes. It’s styled and structured in “New Wave” fashion, reminiscent of “In Praise of Love” (2001) by Jean Luc-Godard, where the second half occurred before the first half. The film is also curious in its black-and-white format and old aspect ration (about 4:3), making it look like an old 50s film. The music score contains a lot of jazz and rock popular 50 years ago, and an impressionistic jazz piano theme that sounds familiar but whose composer I couldn’t identify. The film starts with a prologue in Mozambique, where Comes himself narrates the suicide of an explorer devoured by a crocodile. In Part 1 of the film (“Paradise Lost”) , in modern Lisbon, we meet Aurora (Laura Soveral) , in her 80s, a housemaid, and a concerned neighbor. A daughter has apparently refused contact with Aurora. This part of the film seems a bit aimless, until the characters meet her past lover, Gian-Luca Ventura. In Part 2 ("Paradise"), Ventura narrates the story of his affair with Aurora in the 50s, on the slopes of Mount Tabu. Aurora (Ana Moreira) is married, and Ventura has a friend Mario (Mario Mesquita) with whom he sometimes seems intimate. The story is presented in “silent film” fashion, while Ventura narrates. This part of the film is quite captivating. The “ending” has a certain political irony, having to do with driving European colonialism out of Africa, along with left-wing ideology – money is lost to gambling, and the plantation could be at risk of expropriation. Some critics, however, say that Gomes looks at colonialism as an “aesthetic opportunity” rather than a moral problem. In one line in Part 1, Aurora says she is paying for the sins of other people. I’m not sure I agree. The black and white photography is quite sharp, and at time your mind wants to change the gray vegetation to dark green. The jungle scenes were apparently actually filmed in the Brazilian highlands. The official site (Palace Films) is here. I spent one night in Lisbon in April , 2001, the first stop on a European trip that year. I stayed in a hotel on top of the hill, and saw a lot of condo development that was said to be stimulated then by the Euro. I took the subway once. The next day, I took the night train to San Sebastian, Spain. During the day, I took a bus trip to Fatima to see the shrine related to the Virgin Mary appearance. I believe I caught sight of that place in the film. I saw this film at a late afternoon showing today at the West End Cinema in Washington DC, before a fair crowd for a weekday. The film is in its second week there. 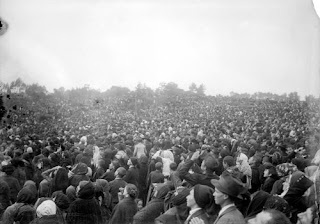 Wikipedia attribution link for “Image of the Sun” at Fatima, here. "Disconnect": A cyber version of "Crash"?